Tap into Tapp for Workflow Expertise  O'Reilly Releases "Photoshop Workflow Setups: Eddie Tapp on Digital Photography"
Most photographers are passionate about their work, but that doesn't mean they're passionate about sitting in front of a computer tweaking photographs. Although they have a powerful ally in Photoshop, some photographers struggle with a love/annoyance relationship with the application. It's understandable: many of Photoshop's features are intended for photo editing, but some are strictly for print and web design. The wealth of features and options can be confusing, distracting, and downright unproductive. 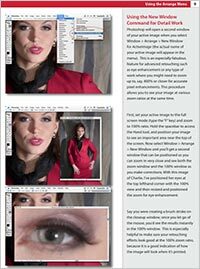 In "Photoshop Workflow Setups" (O'Reilly, US $29.99), Eddie Tapp shows why nothing is more critical than setting up an efficient Photoshop workspace, optimized for the way you work as a photographer. The book is the first volume in the Experts' Studio "Eddie Tap on Digital Photography" series from O'Reilly. It lays out a step-by-step approach to creating an uncluttered and efficient workspace in the midst of Photoshop's vast collection of menus, palettes, and tools. An award-winning photographer and Photoshop Hall of Fame nominee, Tapp is acknowledged as one of the premier trainers of digital imaging in the world, a highly sought-after expert who educates many corporations, studios, and agencies. In this series, he brings his teaching experience to bear on technical issues in six focused and affordable books on digital photography that offer one topic per volume with answers that are quick to find when you need them most. "Photoshop has so many different work areas and tools that it can become confusing or even intimidating to use in a production environment," says Tapp. "With this book, you'll be able to organize Photoshop into a powerful digital darkroom." In addition to this title, books in the "Eddie Tapp on Digital Photography" series focuses on color management; advanced and professional production techniques; controlling digital color and tone; and creative enhancement techniques. With Tapp on hand, you are sure to spend more time behind the lens and less time at your computer. 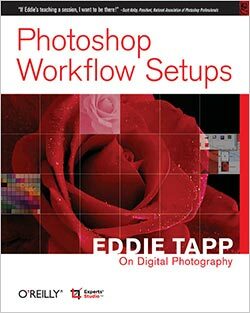 Buy Photoshop Workflow Setups: Eddie Tapp on Digital Photography at Amazon.com for $18.89 (37% discount). Chapter 1, "Creating Efficient Workspaces in Photoshop," is available online.